Japan is situated in East Asia and is an Island country. It lies east of Korea, Russia and China and is surrounded by the Pacific Ocean. Japan has more than 3000 islands that are dotted with many mountains; few of these mountains are volcanic. Hills and mountains constitute about 70% of the country. The majestic cone of Mt Fuji, (covered with snow for most part of the year), the pine islets of Matsushima, are a few places of interest that overflows with natural magnificence that is delicate as well as spectacular. The island nation has active and inactive volcanoes. Changing seasons, snow capped mountains, serene beaches, cherry blossoms and the autumn leaves draw visitors to Japan from across the world. Japan is a beautiful and captivating country; the beauty is as such that it enthralls the visitor. Japan exposes its diverse religious sights that proudly illustrate the ancient culture of Japan. Cherry Blossoms (Sakura): The cherry blossom (sakura) is the unofficial national flower of Japan. This flower is very important to the Japanese culture. You can find a variety of cherry trees in Japan, most of these trees bloom for just a day or two during spring. Hanami (cherry blossom viewing) parties are held under the blooming trees to view the cherry blossoms. Autumn leaves: Viewing of the autumn leaves (koyo) is very popular in Japan and attracts numerous visitors from across the world. Himeji castle, Himeji: The most spectacular castle of Japan, it was never destroyed during any of the wars, earthquakes or fires in Japan. This castle has been declared a world heritage site by UNESCO and is also considered as one among the National treasures of Japan. The wooden interiors and seasonal cherry blossom attract scores of visitors to this castle. Kumamoto Castle, Kumamoto: Kumamoto Castle was constructed by the Kato Clan in 1607 It was handed over to the Hosokawa Clan after half a century. In 1877, Kumamoto Castle was the site of Japan's last civil war. Mount Fuji: Mount Fuji or Fujisan is 3776 meters high and is Japan's highest mountain. The Japanese worship this volcano as a sacred mountain. Yakushima : Yakushima is the first site in Japan to be declared a World Heritage site by UNESCO. Over 75% of Yakushima is covered with thick forest mountains. The high peaks in this forest are covered with snow during winter while the mangrove filled flat lands that are close to the coastline stay subtropical. Yakushima is one of the wettest places in Japan as the island's high topography grabs almost all the inbound rain clouds. Yakushima is also considered as the mystical island of Japan. Yakushima, as per the old characters (kanji) means 'Medicine Island'. The old forest of Yakushima is a wonderful destination for mountains hikers and outdoor enthusiasts. The subtropical beaches are also a major attraction here. Great Buddha of Kamakura, Kamakura: The Great Buddha of Kamakura is a bronze statue of Amida Buddha and is located at the Kotokuin Temple. The height of the statue measures up to 13.35 meters and is the second largest bronze Buddha statue in Japan. Kinkakuji (Golden Pavilion), Kyoto: Kinkakuji is a Zen temple and was earlier known as Rokuonji. The Golden Pavilion serves as a shariden, sheltering sacred relics of the Buddha; it is covered in gold leaf. The existing building dates back to 1955, the original pavilion was burnt by a revolutionary monk in 1950. Kiyomizudera temple: Kiyomizudera means pure water; this temple is one amongst the famous temples of Japan. It was founded in 780 and until date is linked with the Hosso sect (one of the oldest sects within Japanese Buddhism). In 1994, the temple was included in the list of world heritage sites declared by UNESCO. Visitors can get a fantastic view of the city from the wooden terrace of this temple. The water from the spring situated below the terrace is supposed to have healing capacity. Horyuji temple, Nara: This temple was founded by Prince Shotoku, he was the person who introduced Buddhism to Japan. Horyuji is one of Japan's oldest temples. It has a main hall, five storied pagoda and a central gate, they are all located in the temple's Saiin Garan (Western sector) and date back to the 7th century. These structures are supposed to be the world's oldest surviving wooden structures. Horyuji was designated by UNESCO as a world heritage site in the year 1993. Sensoji, Tokyo : The oldest temple of Tokyo is located at Sensoji. The construction of the existing building was completed in the year 645. Toshogu shrine, Nikko: The Toshogu is the tomb of Tokugawa Ieyasu, founder of the Tokugawa shogunate; they ruled Japan for over 250 years until 1868. The shrine is decorated lavishly and has more than a dozen Shinto and Buddhist buildings. This place is located in a beautiful forest. Kenrokuen, Kanazawa: The name Kenrokuen means Garden of the six sublimities - antiquity, spaciousness, artificiality, seclusion, abundant water and broad views. It is one amongst the three most beautiful landscape gardens of Japan and is located next to Mito's Kairakuen, and Okayama'sKorakuen. This garden was constructed by the ruling Maeda family nearly two centuries ago and was opened to public in 1871. Ritsurin Koen, Takamatsu : This is a landscape garden in Takamatsu City built by the local feudal lords during the early Edo Period. The park is very spacious and has many historic trees, ponds, hills and beautiful pavilions. Historic village of Hokkaido, Sapporo: This is an open air museum that depicts the development of the northernmost island of Japan. The village Hokkaido during the Meiji period is depicted very beautifully in this museum. Nagasaki PeacePark: The NagasakiPeace Park marks the atomic bombing of Nagasaki on August 9, 1945. This bombing destroyed wide parts of the city and killed numerous people. The huge Peace Statue stands upright in this park along with various other memorials. A monument around a black pillar indicates the atomic explosion's epicenter. Names of the bomb victims are listed here. The Nagasaki atomic bomb museum is located above the park. Glover garden, Nagasaki: You can get a good view of Nagasaki from this garden; this museum exhibits the various western model buildings of this area. Hot springs of Japan: There are numerous natural hot springs known as onsen across Japan. Hot springs are very popular in Japan and almost every region of the country has hot springs. Hot springs are differentiated by the minerals dissolved in the water; these minerals are beneficial for the health. These hot springs also have a soothing effect on the body and mind. Both indoor and outdoor hot spring baths are available in Japan. Skiing and snowboarding: Skiing and snowboarding are popular in Japan. Relaxing hot springs, breath taking scenery and clean snow attract numerous visitors to these resorts. There are about 500 skiing resorts across Japan, the best snow conditions can be found in the ski resorts of Tohoku and Hokkaido. Festivals in Japan: Matsuri, festivals in Japan are very interesting as each shrine in Japan has a festival of its own. These shrine festivals are annual events and are held as a historic seasonal event. Few famous festivals of Japan are Sapporo snow festival in Sapporo, Sanja Matsuri in Tokyo, Nagasaki Kunchi in Nagasaki, etc. Summers are hot and winters are cold. Soon after summer, rainy season begins and Japan experiences typhoons too. Summer is hot and humid; it snows a lot on the Sea side of Japan during winter whereas remains dry on the Pacific Ocean side. It rains for about 40 days during June and July; typhoon season in Japan is from August and October. The best time to travel to Japan is during early or mid April, mid or late May, or late October, or early November. The temperature is mild and there is minimal rainfall during this time. Attractive cherry blossoms behold the eyes of the visitor during April as multihued autumn foliages do during late October to November. Nozomi: These trains stop only at very important stations. Hikari: These trains stop a little bit more frequently than nozomi trains. Kodama : These trains are slow when compared to the other two and stop in all the stations. 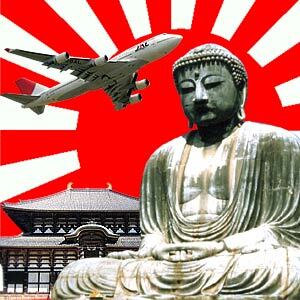 Almost all major airlines operate their flights into the various international airports of Japan. The major international airports of Japan are Narita airport in Tokyo, Kansai airport in Osaka, Central Japan airport in Nagoya. Japan airlines and Nippon airlines are the major airlines of Japan and these airlines connect domestic as well as international destinations. Kosoku or the highway buses are cheaper when compared to trains and connect towns and cities of long distance. Local buses connect cities and towns of short distance. You can also hire a taxi or rent a car as an alternative, taxis are expensive when compared to public road transport. Ferries are the best means of transportation, they connect almost all the islands of Japan and any visitor can enjoy a good ride on the ferry. Ryokan : Ryokan are conventional Japanese style inns with Japanese style rooms and meals. A stay in the ryokan can cost between 6,000 and 30,000 Yen per person. Minshuku: Minshuku are Japanese style bed and breakfast accommodations. They are generally owned and run by a family. They offer Japanese style rooms, and either one or two meals for a price between 4,000 and 10,000 Yen per person. Pensions: Pensions are similar to minshuku except that they offer rooms in Western style rather than in Japanese style. They charge 4,000 to 12,000 Yen per person. Western Style Hotels: Western style hotels are a common sight in the bigger cities of Japan. Numerous international and Japanese hotel chains are available in Japan, they charge between 10,000 Yen to 50,000 Yen per room. Capsule Hotels: Capsule hotels accommodate men who just need a bed, they are accommodated in small capsules that have a television, coin locker and common bathroom. Capsule hotels charge 3,000 to 4,000 Yen per person. The famous local dishes include sushi rice, onigiri - rice balls, kare raisu - curry rice, kayu - rice gruel, fried rice, sashimi - raw seafood, gyoza - dumplings, yakizakana - grilled fish, udon - native Japanese wheat noodles, ramen - Chinese style noodles, soba - native Japanese noodles made from wheat flour and buckwheat flour,tsukemono - Japanese pickles, hotpot dishes called nabe etc. Restaurants in Japan serve only one particular type of food, e.g. ramen-ya - these restaurants serve only ramen. Traditional restaurants in Japan serve on low lying tables though most of the restaurants do have the western style of interiors. Wooden chopsticks have to be separated into two before you start your meal. Bills are presented upside down as your meal is served or after a meal. In few restaurants you should collect your token to buy your food. Japanese do not accept tips. Finishing your food completely is considered as good manners. Hold the chop sticks in one hand and hold the rice bowl in another and lift the rice bowl towards your mouth while eating. First Published Date: 15 Apr 2009 Last modified Date: April 25 2019 This page may have been updated recently as new information is available or the content may have been edited for better readability.